When colleges and universities across the nation opened their doors for the 2016-17 school year, there was guarded optimism that headway had been achieved on many campuses in addressing hazing. Zero-tolerance rules and anti-hazing educational programs beyond the classroom regarding engagement in historically rooted practices of physical hazing have taken hold, supplemented by active enforcement of state criminal laws barring hazing. Programs aimed at dealing with sexual, gender and race harassment and similar negative conduct have also gained steam. Today, efforts to combat hazing have been challenged by a proliferation of social media sites boasting negative messages about racial and ethnic groups and gender-specific groups. Bursts of negative political campaigning using bully-toned and demeaning language seemed to suggest such rhetoric is acceptable and effective in communicating with others. Institutions are responding in myriad ways, from high school to junior high school visits about hazing, bullying and civility in the use of social media to broader and increased monitoring of social media networks and the types of messages they project. “As a Christian institution, it is our goal to build a diverse and inclusive community where all members feel accepted, safe and valued,” Belmont said in a statement about the social media message. “We’re sending kids mixed messages,” says bully prevention trainer Kimberley Ewing, an Indianapolis-based behavior consultant to schools, discussing the emergence of negative social media and the political rhetoric of some politicians. “It sends the wrong message that it’s OK” to disparage and bully, Ewing says, echoing safety advocates and officials at institutions across the country. The impact of the wide range of negative communications to readers, listeners and viewers of all ages suggests that anti-hazing campaigns, and other civility efforts championed since, need to begin in junior high and high schools, say their advocates. “We realized if we’re going to tackle, reduce or eliminate these kinds of abuses, we have to start earlier,” says Emily Pualwan, executive director of HazingPrevention.org, one of the nation’s major anti-hazing action groups. Pualwan, whose group’s efforts gained more serious attention earlier this decade on the heels of tragic hazing deaths at Baruch College and Virginia State and Florida A&M universities, says her historically college-focused hazing organization has expanded its efforts. Now, Pualwan says HazingPrevention.org is paying more attention to high school hazing and bullying, which her Georgia-based organization indicates are at the roots of the social challenges, based on studies, surveys and research. 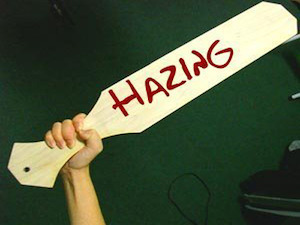 Certainly, much of the scattered research and the anecdotal evidence suggest hazing and bullying have close ties and hazing and bullying have proliferated via social media and a national political climate that legitimizes negative attitudes. A 1999 study for Allen University conducted by researchers Dr. Norm Pollard and Dr. Elizabeth Allen found that 1.5 million students are hazed each year. It found that 91 percent of all high school students belong to at least one group involved in hazing and 48 percent, or nearly half of those surveyed, reported being subjected to hazing. “Every kind of high school group was involved in hazing, including 24 percent of the students involved in church groups,” the report found. Seventy-nine percent of the NCAA athletes surveyed reported being hazed initially in high school. While no study of the magnitude of the 1999 study has since been conducted, subsequent surveys of smaller groups and subgroups indicate much the same, Pollard says. “It tends to first creep up in middle schools, then escalates considerably once you get to high schools,” says Pollard, assessing how early parents, students and academic leaders need to begin teaching civil behavior long before a student’s college years. Across the nation, institutions are broadening their student safety agendas in different ways. Nearly all of the nation’s colleges and universities, large and small, public and private, two-year and four-year, have taken heed of calls from President Obama and the Department of Education to strengthen their focus and practice related to compliance with federal Title IX rules. More institutions have made “zero-tolerance” rules part of their recruitment pitch and have not hesitated to enforce them. At the same time, institutions are trying to wrap their arms around the negative media phenomenon and its elusive nature. “It’s a very powerful medium because it can be anonymous and instantaneous,” says Dr. Joanne Bagshaw, a professor of psychology at Montgomery College and coordinator of women and gender studies at the institution’s Germantown campus. “Many people think once kids graduate high school, bullying ends,” Bagshaw says. “It occurs outside hazing,” she says. “Cyberbullying, the use of any kind of internet medium to harass people,” is the new bullying tool, she says. At Montgomery College, school officials echo peers at similar institutions across the country, in noting that so much of what a student may be encountering happens off campus of the commuter school. Most of the nation’s community colleges are not staffed, as are most four-year institutions, with full-time health, medical and counseling staff who are on ground to help students. However, Montgomery College communications staff monitors social media channels in real time, looking for anything deemed concerning to the health and well-being of an individual who mentions the college online. A group of counseling faculty at each campus make up Behavioral Intervention Teams, or BIT teams, to maintain a healthy, safe, and secure environment, free of intimidation and harm, by systematically addressing behaviors of concern. In California, the 23-campus California State University System monitors its social media channels systemwide, says Toni Molle, director of public affairs for the chancellor’s office at California State University. Each campus of the university has its own team managing its social media channels. At Florida A&M University, where the hazing death four years ago of a university drum major tarnished the institution’s reputation and cost the school many potential students, the university has been methodically trying to regain its stature with a two-pronged strategy, says attorney Bryan Smith, recruited three years ago to manage its recovery strategy. Still, he says, universities need to do all they can to help maintain and promote an environment that promotes student safety. That improves their ability to recruit. “You can’t do it strictly from a risk-prevention perspective,” Smith says, referring to the university’s zero-tolerance policies covering hazing and documents students are required to sign saying they will not engage in such activities and report instances they know about.